Over the years, Lenovo has evolved the chunky ThinkPads of old into the svelte and desirable ThinkPads that they are today. 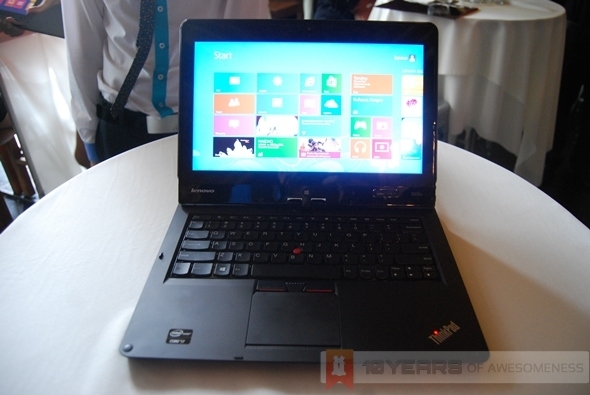 With the ThinkPad Twist, Lenovo has just evolved the ThinkPad. 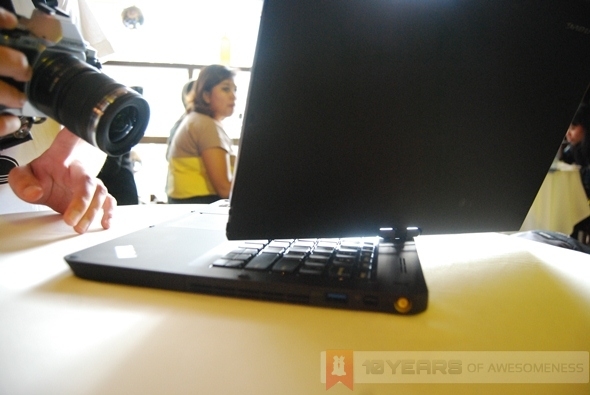 With a unique screen hinge that rotates clockwise 180 degrees horizontally, in addition to the normal vertical motion, the ThinkPad Twist can be used in four modes: Laptop, Stand, Tent and Tablet Modes. Read on to find out more on the ThinkPad Twist. 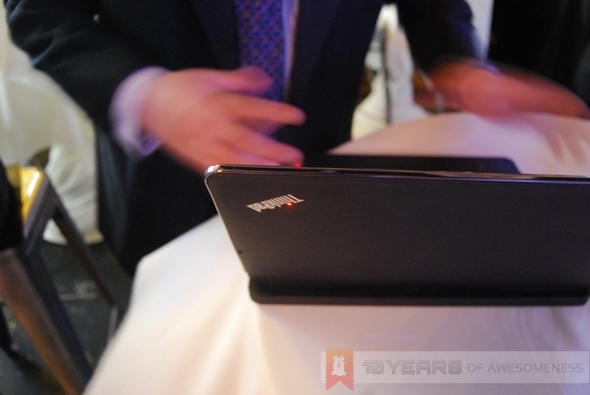 At its base configuration, the ThinkPad Twist is powered by an Intel Core i5-3317U processor and 4GB of RAM. There is also a 500GB hard disk drive coupled with a 24GB mSATA SSD attached for the best of speed and storage space. There is no dedicated graphics card, but the integrated Intel HD Graphics 4000 should hold up for daily usage. On the outside, there is a 12.5-inch touch-enabled screen (duh) with a resolution of 1366 x 768. 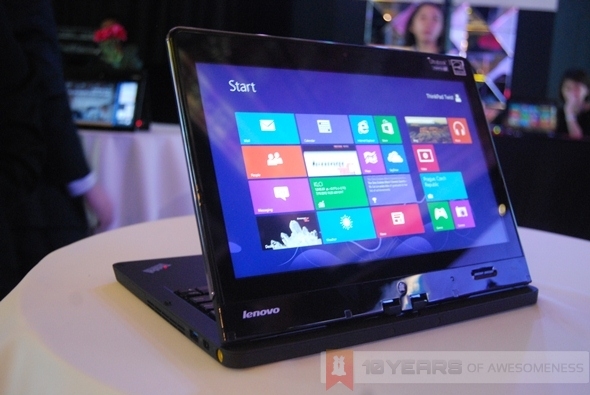 In classic ThinkPad style, the screen is protected by Gorilla Glass for added durability. 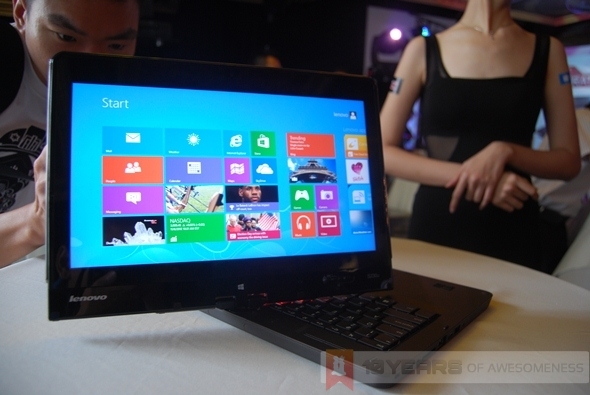 There are also two USB 3.0 ports as well as a mini-HDMI port – all encased in a mocha-coloured laptop that is 1.58kg. 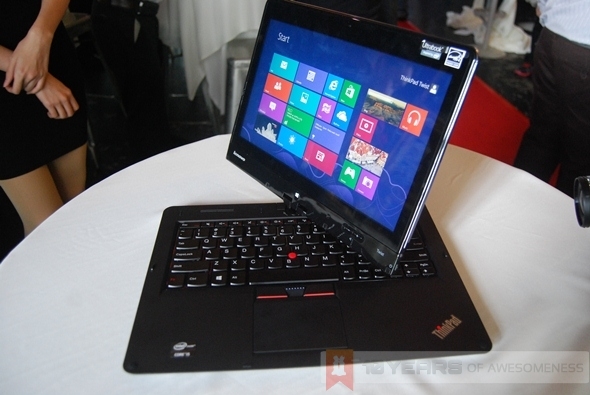 The materials used for the ThinkPad Twist is consistent with that of other ThinkPads from Lenovo, and gives a reassuringly durable feel. 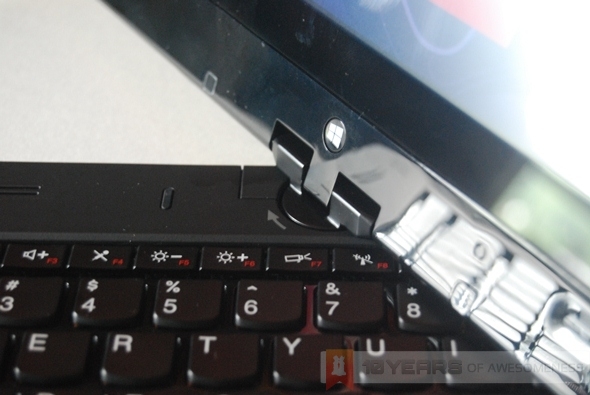 But of course, as with the IdeaPad Yoga, the focus is on the unique hinge found on the ThinkPad Twist. The circular hinge (yes, circular) allows for movements on both vertical and horizontal axes, giving the ThinkPad Twist extreme flexibility without having to move the base. While we weren’t given any numbers, we were told that the hinge will not fail for the life of the ThinkPad Twist (under normal use). 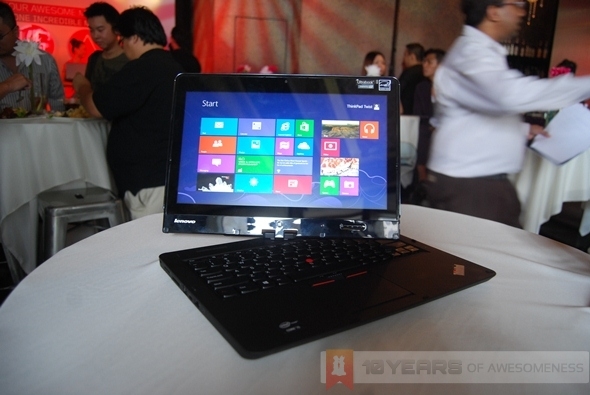 And unlike the IdeaPad Yoga, the horizontal twisting of the screen is perfect for meeting room situations. 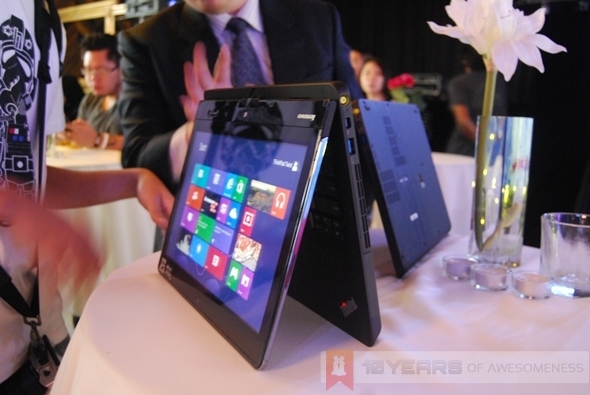 If we’re being honest, the ThinkPad Twist is a bit thick, especially the screen due to the Gorilla Glass. 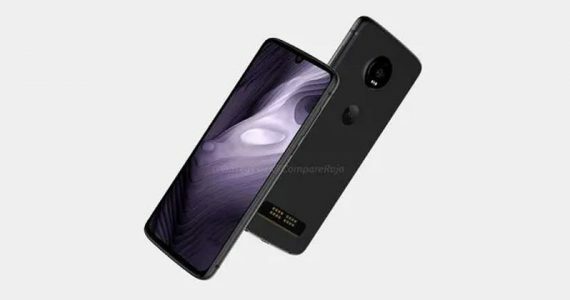 For that reason we doubt that the ThinkPad Twist will be used in Tablet Mode very often, especially after you add the fact that this Ultrabook weighs 1.58kg. That being said, however, I prefer this hinge over that of the Yoga’s, simply because in Tablet Mode, my hands won’t crush the keyboard. In addition, the hinge offers greater practicality in daily usage, especially in the office. 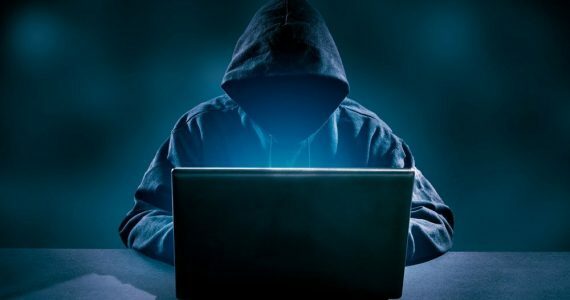 However, ThinkPads are at home in office environments, and we can see the ThinkPad Twist being one of the best Windows 8 hybrids currently in the market right now.